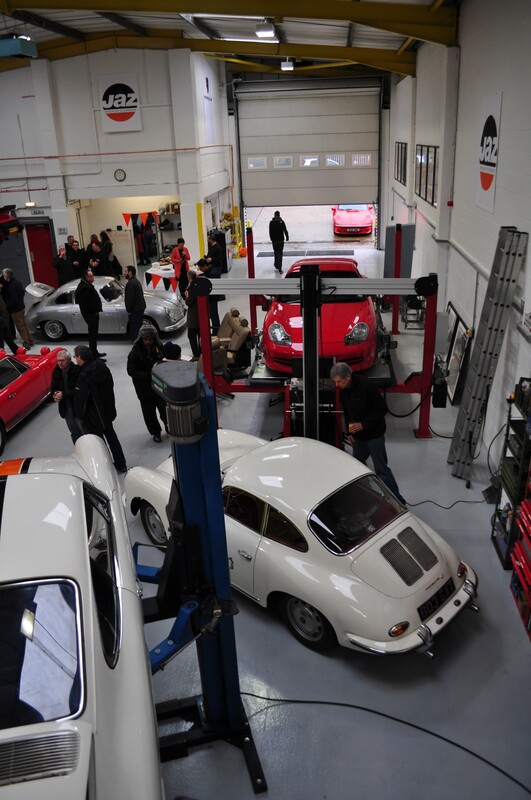 In pride of place at the front of the workshop was a gorgeous silver 356 Carrera GT. The sublime Ferry Porsche & Erwin Komenda designed lines of this car – all curves with not a straight line in sight really make it a work of art. Under the engine lid lurks the equally lovely lovely Ernst Fuhrmann designed 4-cam motor and the rear of the car has an especially purposeful look thanks to the Sebring exhaust sprouting out under the rear bumper. This made for some raucous delight for the gathered throng as the engine was fired up part way through the afternoon. Tucked into the back of the workshop was a fabulous 2.5ST with its beautifully sculpted flared wheel arches to accommodate fat racing wheels & rubber. Steve told me that as well as being actively raced this car was used by the factory as a development car so it has some great history but that doesn’t prevent it from still being raced in the likes of Classic Le Mans. 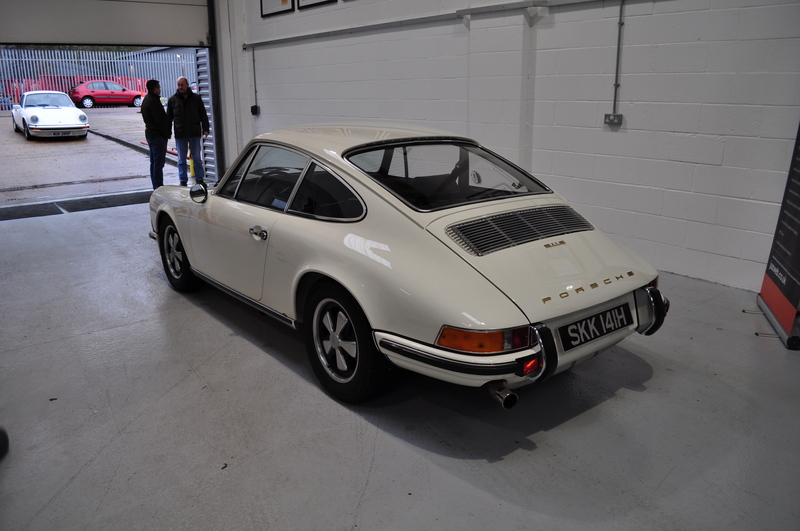 This 2.2 Litre 911T freshly restored by Jaz (mechanicals) and Sportwagen (bodywork) looked fantastic inside and out. Having been sourced from Arizona – it was a much better base to start from than the usual rusty wrecks but the quality of the bodywork, mechanical and interior restoration was just astonishing. The good news is – it’s for sale to some lucky buyer! 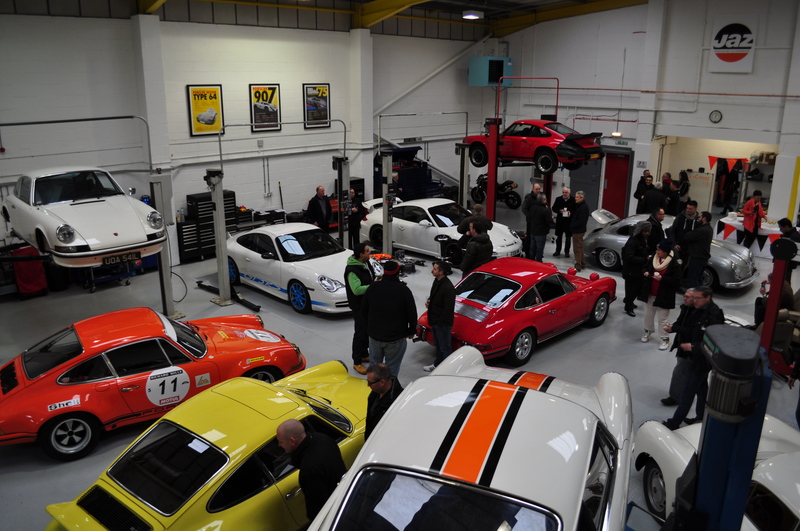 Perched up on a lift was this beautifully restored early 911 race car. It’s showroom finish belied the fact that this will be hurled enthusiastically around race tracks in the near future. With the car lifted into the air, the simplicity of the car’s design could be seen at close quarters. I’d seen this car before at Jaz and it was nice to see it again at the open day. It has great provenance, being the former “company car” of a certain Vic Elford during the time he was racing factory cars. I can think of worse “company cars”! The story goes that the car wasn’t quick enough for “Quick Vic” so the factory took it back and replaced the 2.2S short stroke engine with the then new long stroke 2.4S motor to deliver more grunt. They also fitted the 2.4 front chin spoiler to reduce front end lift. 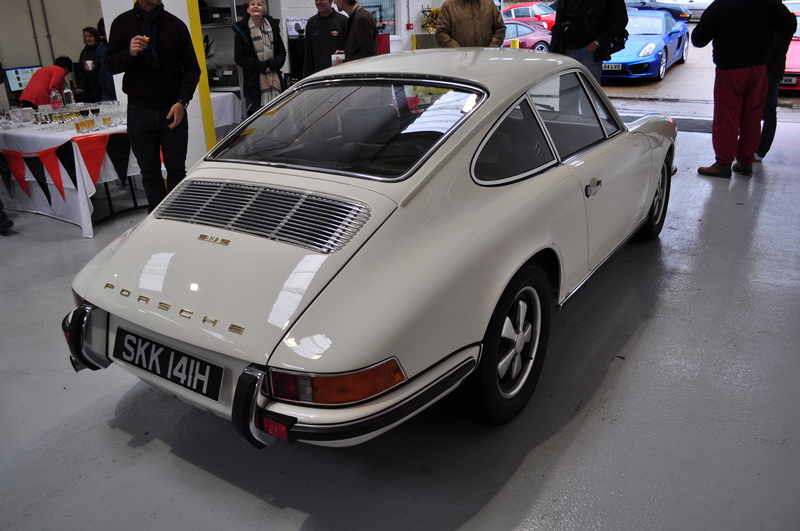 Previous PostLondon Classic Car Show – Sat 10th Jan 2015Next Post911 2.2S Engine Rebuild – Part 14: Dizzy, Aerated & Exhausted! The 911 should respond better to pampering than me! I’m a lost cause.